When faced with the need to cut thousands of parts from reels in order to make them into kits, “Der Zerhacker” decided to automate the process. 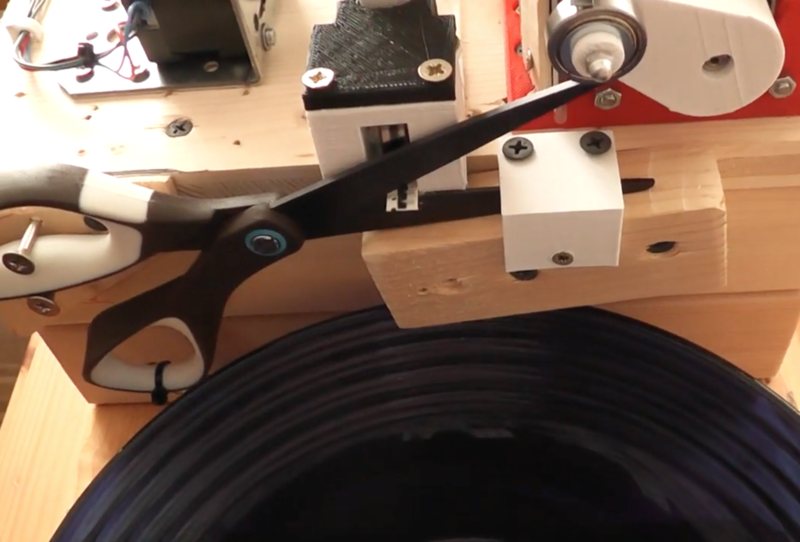 For his robotic machine, an Arduino Pro Mini pulls strips of tape into position with a stepper motor, coloring them along the way with a marker. 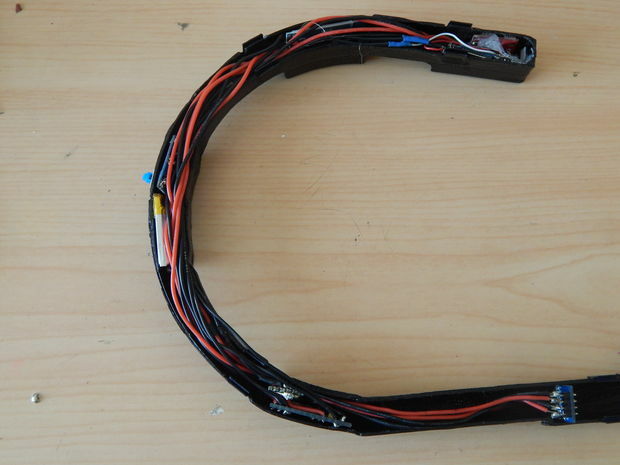 An infrared sensor is used to align the correct number of parts with a pair of scissors, which are then cut via a second motor and tumble into a basket. When you travel, you likely collect photographs and knick-knacks that can be displayed nicely for yourself and others. David Levin, however, took this one step further and used an MP3 recorder to capture the sounds of the places he and his wife have visited. But how does one show off sounds? 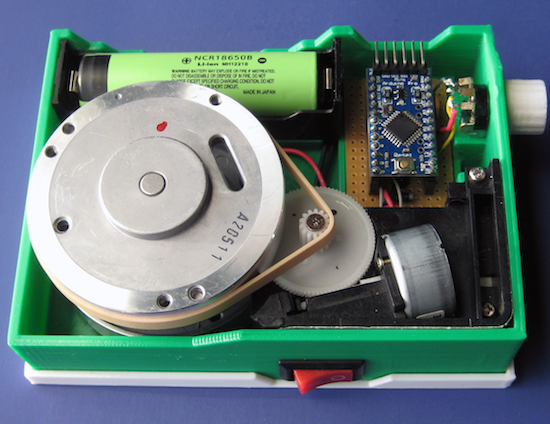 Levin has a clever answer for that in the form of his Arduino-based Audio Memory Chest. 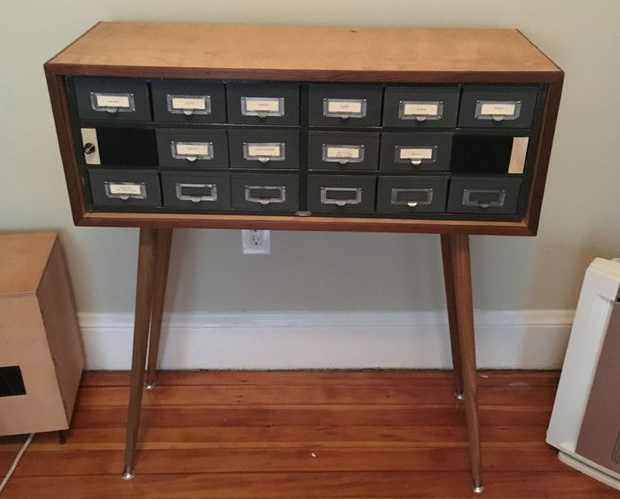 The project uses a recycled card catalog to hold items from each place traveled, and when one drawer is pulled out, a magnet and Hall effect sensor tells an Arduino Pro Mini which drawer has been opened. A serial MP3 player module then produces a random audio file recorded at that location, treating the user to both the sights and sounds of the region! My wife and I have been lucky enough to travel all over the world together during the past few years. Wherever we go, I collect little knick knacks, souvenirs, and ephemera. I also use a little MP3 recorder to capture sounds (marketplaces, street sound, music, etc). It’s always amazing to listen to these later—they immediately bring you back to a place, far better than a photograph alone could. Want to read more, remember to take your vitamins, or even take out the trash? With the “Dory” Arduino-based tracking device from YouTuber YellowRobot.XYZ, now you can! 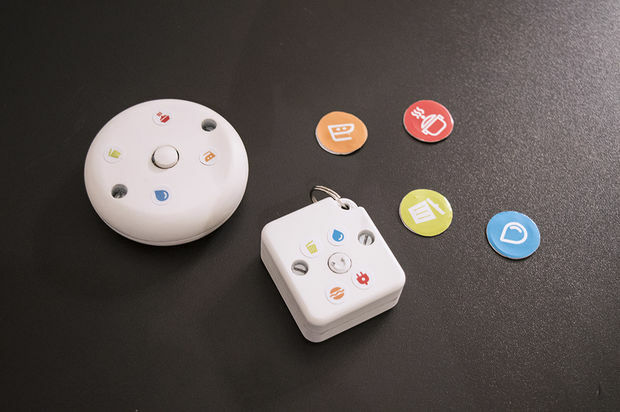 Dory–which comes in both a circular and smaller square version–uses an NFC reader to sense tags attached near the object that needs work. 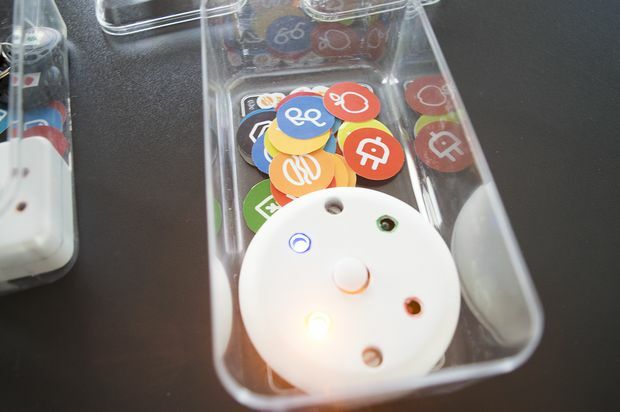 When you complete a positive action, you simply tap the nearby tag and the small gadget will light up its corresponding LEDs via an Arduino Pro Mini. If you’d like to know where you are on your habit count, this is displayed with a button in the middle, and can be reset by holding it down. Beside from tracking habits, Dory is a great reminder of what can be done with NFC tags! Instructables author Daniel Quintana loves mountain biking, but after having to interrupt a ride to continuously check the time, he did what any normal teenager would do in this situation: he created his own Google Glass-like headset from scratch. 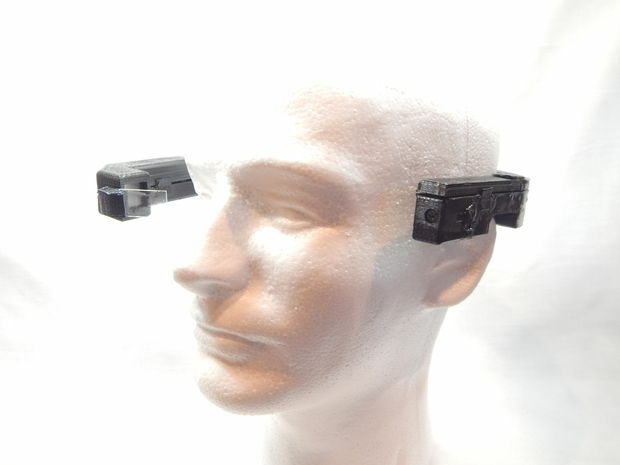 His DIY AR device, called “Uware,” takes the form of a 3D-printed enclosure with a tiny 0.49″ OLED screen stuffed inside, along with an HC-06 Bluetooth module, an APDS-9960 gesture sensor, a 3.7V battery, and of course, a tiny Arduino Pro Mini for control. In normal usage, the wearable displays the time and text messages transmitted from Quintana’s phone over Bluetooth via a custom app that he wrote. Swiping right in front of the gesture sensor puts it into camera mode, allowing him to capture the environment hands-free! Want to see more? You can find Quintana’s write-up here, or check out Uware’s prototype electronics setup and custom magnetic charging rig in the videos below! Chances are you’re likely familiar with POV displays. These devices move through the air at a high enough speed to trick your eyes into thinking that a sequence of flashing lights is actually a solid image. 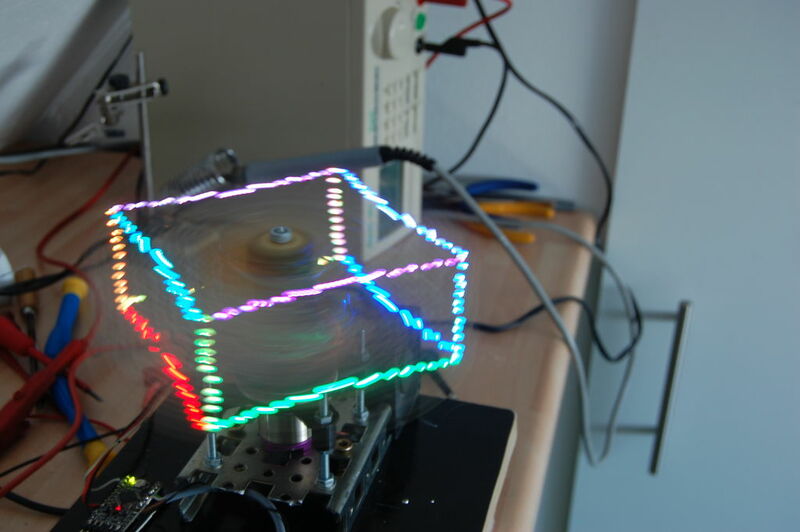 Though interesting enough in two dimensions, LED aficionado “Gelstronic” decided to add more depth to his display, stacking 12 LED-enabled circuit boards in a helical pattern. This meant his project, dubbed “PropHelix,” can create a light display in not two, but three dimensions. PropHelix’s LED pattern is controlled by an also-spinning Propeller board, powered by a wireless charging setup normally seen used with mobile phones. An Arduino Pro Mini in the base of the assembly takes care of making things spin at the correct speed via a multicopter-style ESC and brushless motor, while an encoder handles feedback. You can find more details on this build in its Instructables write-up here, or check out the beautiful images in the video below! If you’re familiar with the Segway or other vehicles that balance in what is known as an “inverted pendulum” configuration, you may think that while interesting, creating something similar would be too complicated or out of your budget. Though perhaps still not simple, Joop Brokking takes you through his design for this type of bot in the video seen here, making it accessible if you’d like to build your own. 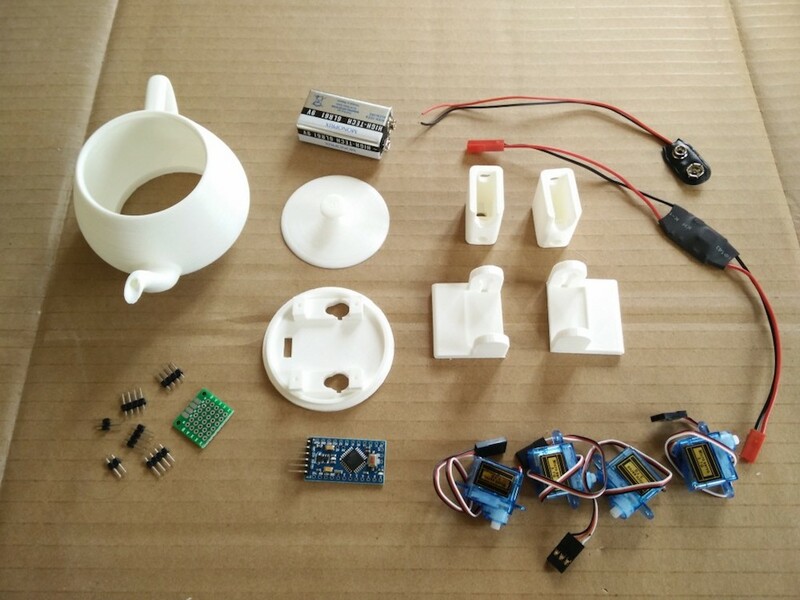 The robot, which will cost about $80 in parts, uses two stepper motors for greater movement precision than could be had with normal DC models, and employs an Arduino Pro Mini, along with an MPU-6050 accelerometer/gyroscope for control. It can be driven around by a Wii U-style nunchuck, which transmits to the robot via an Arduino Uno and wireless transceiver module. You can find more info and product links for this project on Brokking.net. You may have seen robots that wobble around, such as BOB, OTTO and ZOWI. Though their locomotion style of shifting the unit’s weight on huge feet is clever, they all share a rather similar look. French computer scientist Paul-Louis Ageneau decided to do something about this and created his own biped in the form of a dancing teapot a la Disney’s Beauty and the Beast. To accomplish this, he attached four servos to the robot’s hips and ankles, which were connected to an Arduino Pro Mini and powered by a 9V alkaline battery. 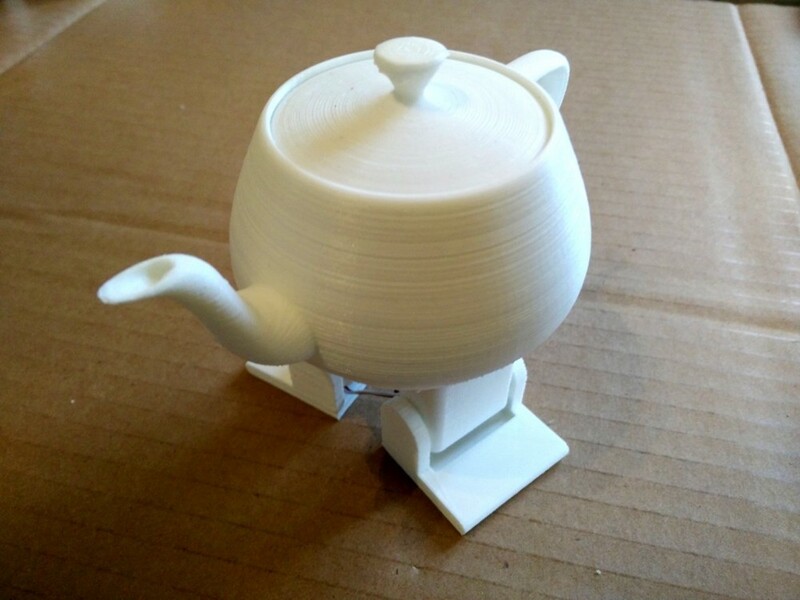 All the electronics are housed inside the 3D-printed teapot. 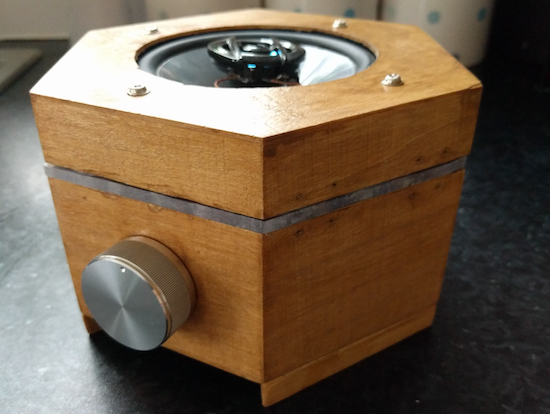 It’s a neat build in itself, and in a separate post he goes over how to play music on an Arduino, which should make this little guy even more entertaining! You can find Ageneau’s original blog here, as well as the Disney-like bot’s code on GitHub. Using an Arduino along with some 3D-printed and salvaged parts, hacker “notionSunday” made an excellent photo turntable for under $10. In a masterful display of converting one man’s junk into another man’s treasure, notionSunday used a VCR head as a very smooth-looking bearing surface for a small turntable. A DVD-ROM drive motor, a potentiometer from an old TV, and screws and wires from other electronics rounded out the internals of this build, as well as an Arduino Pro Mini with an H-bridge driver for control. All of this was placed inside of 3D-printed housing, then a disk was added to the top for other contraptions to rest on. You can see it in action around the 8:00 mark in the video below. What really sticks out are the 3D-printed circumference markers, apparently there to indicate the speed of rotation or to hypnotize viewers. Check out notionSunday’s YouTube channel for more interesting projects, or his website for more pictures and code. The great thing about holidays is that they always seem to require some shiny things. The modern version of shiny things seems to be LEDs and advances in technology being what they are, we now have amazing programmable LEDs. And programmable LEDs mean animated shiny things! 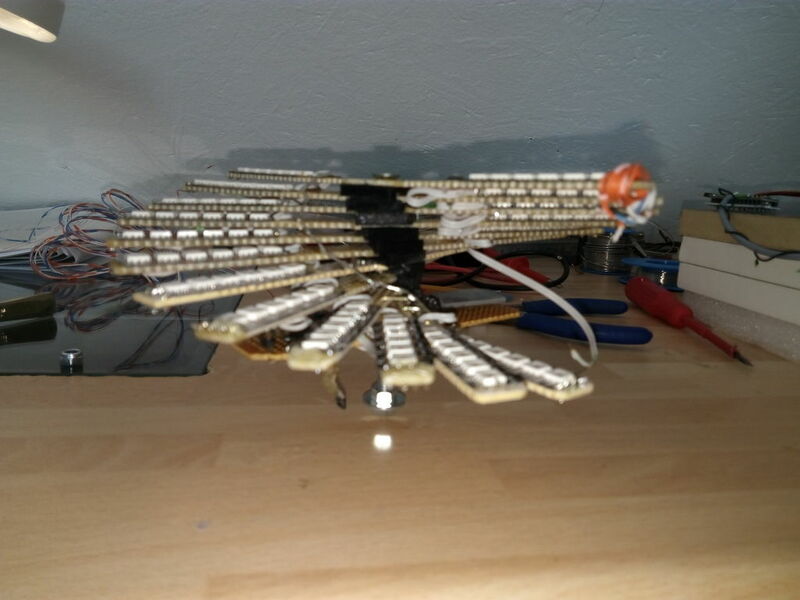 Years ago, [wpqrek] made an LED ornament using discrete components. This year he revisited his ornament and decided to make a new, animated, RGB ornament. [Wpqrek]’s build is based around five WS2812b strips connected to an Arduino Pro Mini. The ornament itself is a thick styrofoam ceiling tile cut into a star shape with a red-painted wooden frame. Decorated with baubles and stars, the LED strips start in the center and end up at each point in the star. With each strip connected in parallel to the Pro Mini, [wpqrek] used the Arduino Light Animation library to handle the animations. [Wpqrek] says the result is too big for his tree, so he uses it as a stand-alone ornament. Perhaps using lighter materials would help — or getting a bigger tree! Check out the Arduino lighting controller or the Trompe-l’oeil Menorah for more holiday hacks. Imgur user Peter Clough recently created his own colorful “Magic Box” Bluetooth speaker assembly with a NeoPixel visual display. 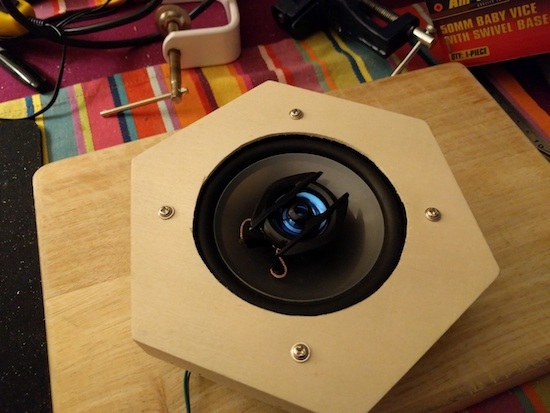 If you need a speaker (or rather a speaker with an enclosure) the easiest way is usually to just buy one. On the other hand, if you want something really awesome and unique, why not build it yourself? Clough did just that using an Arduino Pro Mini and a Bluetooth receiver along with a strip of programmable LEDs that react to the emitted sounds–made possible by an electret microphone amp. 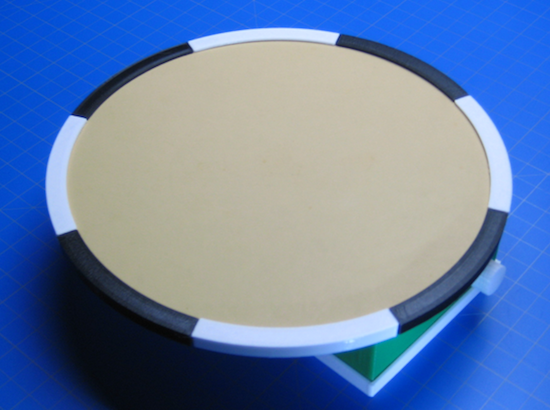 Cleverly, the case was sourced from a hobby supplies store, while neodymium magnets were used to keep the lid in place. Clough also employed a “really beefy” 20W 4Ohm speaker, as well as a rotary encoder with push button for volume and play/pause control. You can find more details, including a schematic, on the project’s Imgur page.